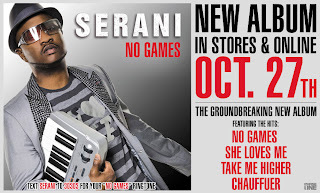 “Pop-Dancehall” artist Serani is gearing up for the release of his first U.S. full length album titled No Games. The album comes on the wave of the huge success of his international hit single “No Games.” The record has enjoyed incredible momentum with multi-formats radio play that includes Urban AC, Urban, Rhythmic and Top 40 and over 30,000 spins! The video for “No Games” is on rotation on BET, BET J, MTV Jams, MTV U, MTV2, VH1 “Island Soul” and Music Choice “Hit List” on demand, where it picked with 30,000 views a week during May/July 2009. The second single “She Loves Me” is just starting at radio and it’s already picking up steam. The video was shot in LA by Rich Newey, one of the directors under famed director Jesse Terrero Films' umbrella. The video will go for adds at national channel the second week of October. No Games consists of 14 tracks, including a wealth of new material, and heavily features Serani himself as a producer. Upcoming hot Jamaican production outfit Chimney Records, along with Keepleft Record's Leftside further represent the Jamaican sound on the album with Miami-based Blackout Movements (Mim's This is Why I'm Hot) and fast-rising new US producer Canei, protege of Just Blaze (Ti & Rihanna Live Your Life) closing out the production credits. No Games is in stores and available on iTunes and Amazon October 27 and there's never been a better time to support and buy Jamaican music!